What is the Mitsubishi I-CAR!? In 2006, Mitsubishi released a new super small hatchback to compete in an equally super small segment of the market. The Mitsubishi I-CAR. It was designed to thrive in city conditions with the ability to tackle freeways when commuting to and from the office. It had to be small, economical, easy to drive, park and be practical for daily use. Following its overwhelming release in Japan, the Mitsubishi I-CAR went on to win “car of the year award” in 2007. Clearly they had done something right! Turbocharged… Mid Engine and Rear Wheel Drive set up… are we still talking about the same car here? Yes – the Mitsubishi I boasts a “supercar” inspired platform with a 660cc Turbo MIVEC engine powering the rear wheels. Not quite supercar performance but it does make for surprisingly nimble and light handling – ideal for navigating narrow city streets. This setup also maximises the interior space having the engine and drivetrain located at the rear/ middle of the car. This allows 4 adults to comfortably be seated with adequate sized luggage space which can further be extended by lowering the fully flat folding seats. The interior cabin is also generously specced too. The proximity keyless entry and start/ stop feature is a convenient touch. No need to fumble around for keys as providing it is on your person you can lock/ unlock and start the car. You also get air conditioning, CD radio, electric windows and mirrors all around and automatic operating headlights. Fitted with dual airbags, ISOFIX seats, ABS brakes and Electronic Brake Distribution you can also rest assured you’re in safe surroundings too. Weighing in at around 900kgs, these nippy turbo charged city go-karts are reasonably quick off the line and very responsive through the rev-range. With great visibility through the huge front and surrounding windows, the exceptionally small front overhang/ bonnet area also makes parking a breeze. You can duck and dive down city side streets with ease and fit in parking spaces not possible for most other vehicles! What about fuel? Premium unleaded no less with an average fuel consumption of 5.4L/100kms from the 35L tank. Better than most Hybrids! So what’s not to like about the Mitsubishi I-CAR!? Well it is very small… not ideal for long family trips down south with all the luggage and dog in tow! They can be a little unsettled with strong crosswinds due to their miniature size.. nothing serious nor to worry about, but something to bear in mind on a windy day along the freeway! Due to its pocket size, service running costs and insurance are conveniently light on the wallet too. 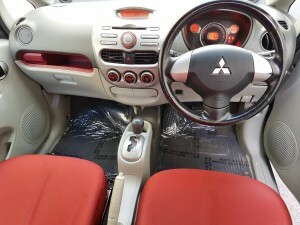 At Fabcar we use a Mitsubishi I-CAR as our promotional and courtesy vehicle. Other than annual servicing we have had no faults in the past 6 years nor heard of any issues from other sold examples. We source the majority of service items locally and offer great rates on annual servicing for all of our customers. 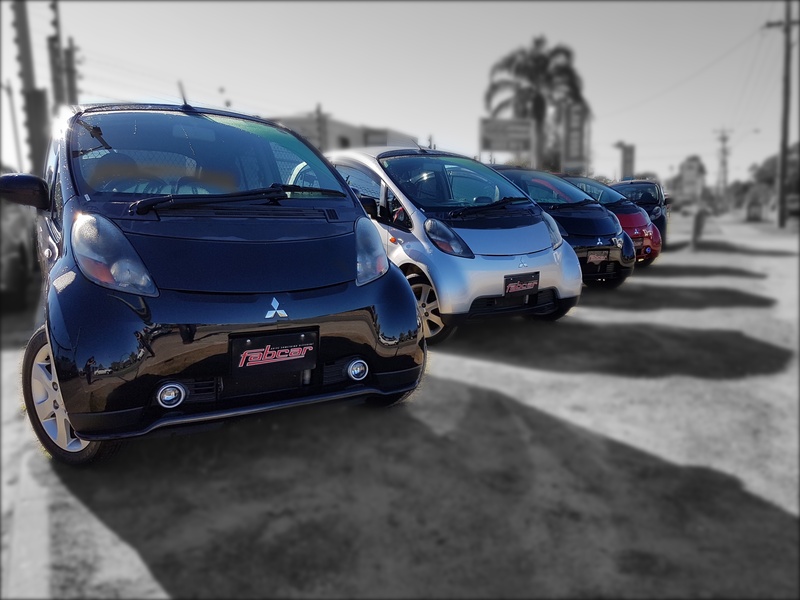 At Fabcar we have a fresh batch of 2006 – 2008 Mitsubishi I-CAR’s just arrived. Starting at just $11,990 they represent amazing value and ready to drive away today! 3B20 (660cc) DOHC MIVEC Intercooled turbo. Fuel octane – regular unleaded. Transmission shift knob – PVC. Rear suspension – 3 link De Dion. Park brake – lever type. 4 wheel ABS with EBD. Steering wheel – 3 spoke urethane. Keyless entry with 1 transmitter. Alarm (horn, turn & buzz). Door outer handle – colour key. Windshield glass – laminated & IR cut. Tailgate glass with hot wire. Seating capacity – 4 persons. Driver’s seat – slide, recline, height adjuster. Assistant seat – slide, recline adjuster. 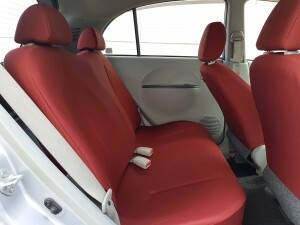 Rear seat – split back & fold with recline. Front seat belt – 3 point with ELR X 2. Rear seat belt – 3 point with ELR & ALR X 2. Instrument panel upper box with lid. Front door trim – formed type with door pocket. Rear door trim – formed type. Floor mats & carpets – needle punch. Vanity mirror with lid & ticket holder – driver side. Vanity mirror with lid & ticket holder – passenger side. Electric door mirror – black. Roof spoiler with stop lamp. Heat & A/C control – dial type. Halogen headlamps with levelling device. Windshield wipe with variable intermittent. Rear window wiper & washer. Seat belt warning lamp (driver only). AM/FM radio single MP3 CD. Accessory socket on instrument panel. Engine 660CC DOHC MIVEC intercooled turbo.